A View of the Blandford Frigate, Nicholas Pocock, c.1760, Bristol City Museums. I am indebted to follower Drew Godzik for help in researching today's post. 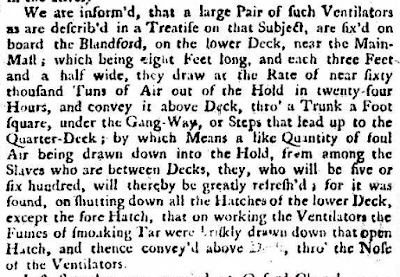 Like the other two slave ships that Captain John Brackenridge commanded on the slave trade, the Blandford hailed from Bristol. The artist, a soon to be expert in maritime art named Nicholas Pocock, certainly did not sail aboard her, as he was only three years old when she made her only voyage to the African coast. 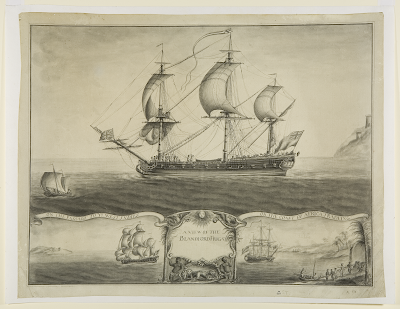 Launched on February 13, 1719/20, the Blandford was a sixth rate twenty gun frigate. She had an unremarkable career in the Royal Navy, and may not have seen any action. Blandford served in home waters and on the North American station for a little over twenty years, suffering occasional issues with her main and foremasts. 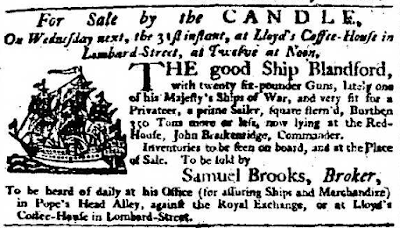 Condemned as unfit for the navy in 1741, Blandford was sold and replaced by another sixth rate Blandford that same year. 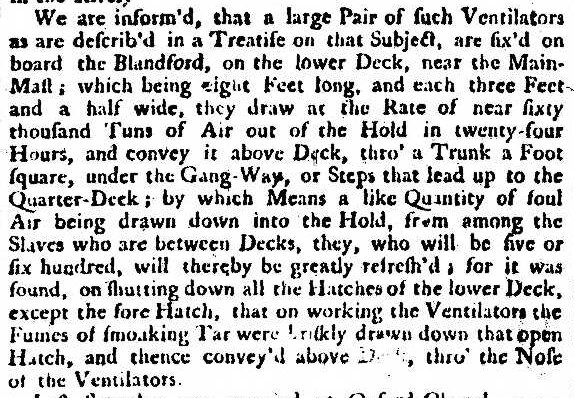 Late in 1743, her owner, James Pearce, decided to try Blandford in the transatlantic slave trade. Perhaps in the year between her being sold out of the navy and sailing for West Africa was used to refit her. Certainly, Blandford, received a notable addition, worth mention in the London newspaper Daily Advertiser. These ventilators make no appearance on Pocock's illustration, but then they might not have stood tall enough to be seen from the shore in any case. Whether or not they were effective is up for debate. Of the 468 enslaved people forced aboard from an unknown African shore, around four hundred survived the Middle Passage to be sold at Kingston, Jamaica. Had Pocock actually seen the Blandford in person, some fifteen years after her voyage, and nearly twenty since the navy had sold her as unfit? Pocock, as with his other depictions of Brackenridge's slave ships, populates the vessel with her crew. These two tars wear cocked hats, jackets that end below the waist, and trousers. The men crowded on the foc'sle are similarly dressed in single breasted jackets and trousers. At least one of them wears a barge cap. Further astern, their mates work to the sound of a speaking trumpet. Ashore, a gentleman (probably Captain Brackenridge) gestures to a smal boat where enslaved men are being loaded. The sailors carry sticks and wear jackets and trousers, save for the sailor ashore who wears a smock. Another boat, or perhaps the same as above but in a different view, is manned by four sailors with barge caps, one of whom holds a pipe. The Blandford did not last long as a slave ship. 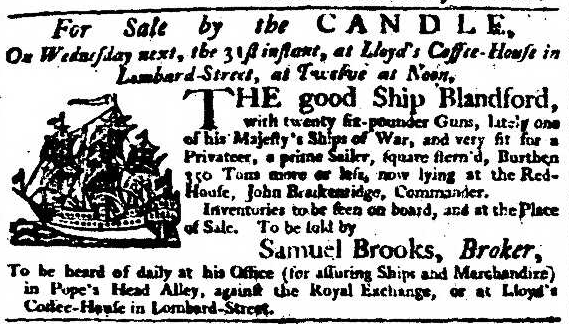 On her return in 1745, she was sold.